More and more I’ve noticed homeless people on the streets and in city parks: panhandling, sitting, sleeping, and generally looking out of sorts. Part of this could be because I’ve been following OKC’s The Curbside Chronicle and their strategy to employ methods for helping this group get off the streets. In turn it’s made me more mindful of those I do encounter and observing their overall condition. And I’ve notice this trend isn’t exclusive to Oklahoma City as I’ve seen more visibly homeless folks in Norman too. And it’s just not the standard dudes you usually see. I’m seeing new faces. Curious if my observations stand up to the facts, I went looking for data. 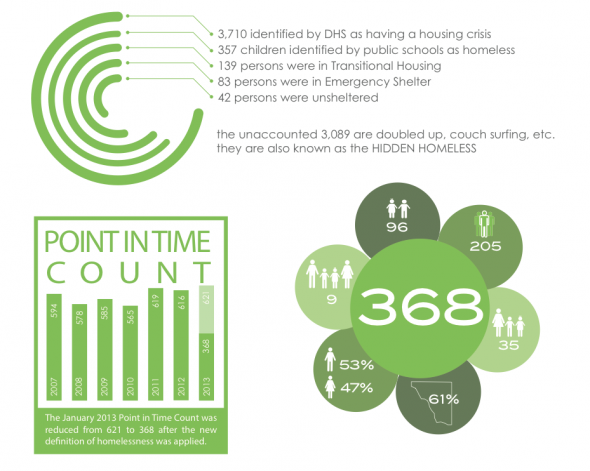 Oklahoma City’s 2012 Point in Time (PIT) snapshot of homelessness is gathered by the Homeless Alliance. I’m not sure when 2013 will be released, but I wanted to know what sorts of ills might contribute to someone ending up in poverty and living on the streets. Keep in mind, while the merits of Obamacare are still being debated, some of these “stats” are people who cannot not afford serious healthcare, may not have a job, nor have the ability to hold a job even if temporarily employed, to say nothing of discrimination they face should they go looking for employment or help. That’s kind of sobering, isn’t it? Looking at the numbers in the special needs category, it appears domestic violence went up significantly in 2012 (202), which is much higher than the stats reported in 2009 (38) and it’s a category that’s show consistent growth. One wonders if reporting just got better, or if the spike is related to drug abuse, which is also another category that’s seen both growth and decline. It’s higher than previous years (473), but a little less than 2011 (519). Here’s another info graphic from the same report. Moving along to Norman, and Cleveland County in general, I have a copy of their 2013 Point of Time as provided by Zakk Flash. It also says in their report that for most, homelessness is short term and only happens once, and that on any given day in Cleveland County 1 in 70 people face a housing crisis. To that end, I discovered on Monday that Zakk Flash intends to introduce a proposal in Norman to help people going through difficult transitions in life. It comes at a time when elsewhere homeless people are being treated very, very poorly. One such story to pop up recently comes from Think Progress. A Hawaiian State Representative, Tom Brower (D – for Democrat, not “Douche Bag,” but you can draw your own conclusions after this), is smashing homeless peoples’ possessions. Wait for it: with a sledge hammer. He’s basically terrorizing people with substance abuse problems, with histories of domestic violence, runaways, and the mentally ill. It bears mentioning that Hawaii also has one of the highest homelessness rates and approved a move to raise $100,000 over the course of two years to fly homeless people back to the main land rather than investing in strategic and sustainable methods for treating people’s physical addiction, illnesses, and emotional disorders. OKC.NET: What is your occupation and do you see the effects these laws and definitions have in everyday settings? And have you researched the rates of Norman’s homeless population and if it has gone up recently? Flash: I work for Central Oklahoma Community Action Agency (COCAA) as the case manager for the Norman Housing Programs. We own 23 housing units in the City of Norman and use them to serve our community’s homeless, by housing individuals and families and helping the homeless achieve residential stability, increase their skill levels and/or income, and obtain greater self-determination. Each year in January, homeless service providers and the City of Norman do a Point-in-Time (PIT) count. The count hopes to enumerate the homeless persons sheltered in emergency shelter, transitional housing, and Safe Havens on a single night. We also seek out unsheltered homeless persons, focusing in particular on known homeless encampments. We know we can’t reach everyone, but we try to get an accurate number. 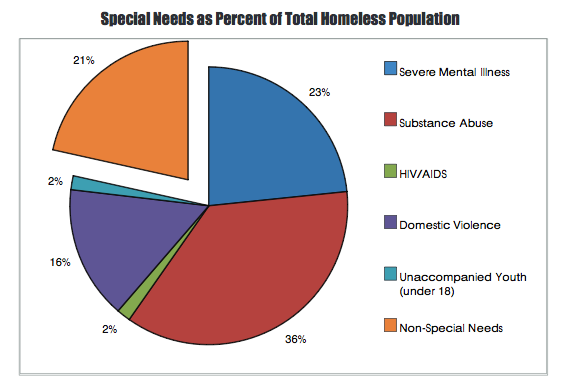 With the new definitions of homelessness required by HUD, the homeless count was 264. Using the old definitions, the count for 2013 would be 621 compared to 615 in 2012. The new definitions do not include identified homeless kids in the public schools, couch surfers, or Department of Human Services numbers. If all of those were included, it is estimated that there would be a count of approximately 1500 homeless persons in Cleveland County. OKC.NET: So are the new HUD definitions trying to minimize the actual problem on paper? Flash: The new definitions of homelessness from HUD are an effort to get everyone on the same page and speaking the same language when it comes to identifying who is homeless. But I disagree with the definition; a homeless family sleeping on the floor of a relative’s house is still homeless. That sort of housing isn’t permanent, isn’t adequate, and often isn’t even safe. 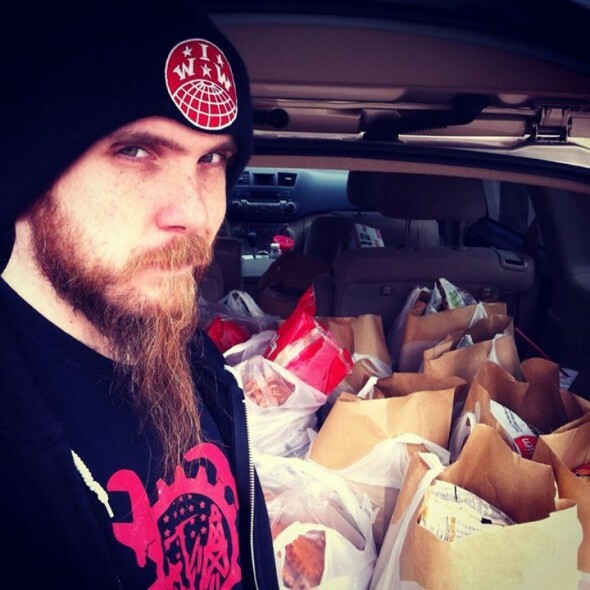 Zakk Flash delivering food to the poor in OKC with Oscar Romero Worker House. OKC.NET: As a case manager is there a way to help people who don’t meet these new definitions? Flash: As an activist, I hope to do that every day. OKC.NET: Are there consequences for not meeting the new definition is what I’m wondering overall? Flash: Serving individuals who fall under that definition is how one gets funding from the Department of Housing and Urban Development. Some agencies are able to serve other populations through grants and private donations. My attempt to get other funding can be found here. Below is Flash’s proposal. He says he intends to refine the language and get feedback, but will likely submit it by the week’s end. In the meantime, because I have eyes, I’ve also noticed an article floating around on Facebook about Norman’s vacant building problem. “Owners who keep their homes and businesses well-maintained bear losses of $2.7 billion in property values because of blight from poorly maintained properties, the study indicated. It has been a growing problem, with the number of long-term vacant housing units rising 25 percent between 2000 and 2010. I really don’t want to point out the obvious, but it’s not too much of a stretch to imagine shelter solutions and reducing blight as a “two birds, one stone” situation. Sure there’s the matter of getting it all worked out legally and financing such efforts, it’s not something you can just snap your fingers and solve, but at least thinking of ways to take on these issues is better than going to Andrew’s park and seeing people sleeping in the gazebo or in the little houses by the splash pad. Or noticing after a certain time of day that there are more homeless people than park-goers. Laws that criminalize homelessness are multitudinous; we’ve seen them come into force across the country for years. My first taste of this was as an organizer with Food Not Bombs, seeing comrades arrested for serving free food to the homeless on public property. In Oklahoma, there has been a long history of discriminatory laws and ordinances that have disproportionately affected people with low incomes and who are without homes, including, but not limited to: Jim Crow laws, sundown town ordinances, and vagrancy laws. 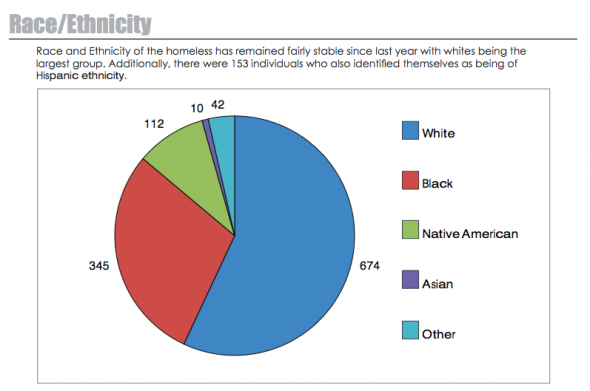 These local ordinances result in de-facto segregation as homeless people are forced out of specific jurisdictions or out of specific neighborhoods or places. These practices condemn large groups of inhabitants to dwell in segregated districts or under depressed living conditions that result in crowded, unsanitary, substandard, and unhealthful accommodations. Furthermore, these policies result in criminalization of homeless persons who do not choose, or are unable, to migrate. Today, in this state, as well as across the country, many people are denied housing due to their status of being homeless, living in a shelter,a vehicle, the street, or the public domain; denied employment due to their current status of being homeless or living in a shelter or a vehicle on the street; denied the ability to make certain purchases or vote as a result of not having a fixed or residential mailing address or having a post office box as a mailing address; have access to safe, clean restrooms, water, and hygienic supplies necessary to maintain health, safety, and dignity, especially with the proliferation of closures of public restrooms. Lacking the resources necessary to obtain adequate legal representation, homeless persons are often denied relief or damages through the courts. Children in homeless families are denied the ability to continue receiving education in their preferred school if their family’s shelter lies outside the boundaries of their former district. Many persons have been rendered homeless as a result of a deep and prolonged economic recession, a severe shortage of safe and affordable housing, a struggling mental health system, and a shrinking social safety net. There’s no point in criminalizing homelessness. It doesn’t go away just because police roust sleepers from sidewalks or throw them briefly into jail. Therefore, I’ve researched, compiled, and composed this proposal for my community, the City of Norman. This draft will be sent to the Norman City Counsel for review; I hope to see it enacted, in its entirety. This bill would enact the Homeless Person’s Bill of Rights, which would provide that no person’s rights, privileges, or access to public services may be denied or abridged because he or she is homeless. (a) There is created a Homeless Person’s Bill of Rights to guarantee that the rights, privacy and property of homeless persons are adequately safeguarded and protected under the laws of this City. The rights afforded homeless persons to ensure that their person, privacy and property are safeguarded and protected, as set forth in subsection (b) of this section, are available only insofar as they are implemented in accordance with other parts of the general statutes, state rules and regulations, federal law, the state Constitution and the United States Constitution. For purposes of this section,”homeless person” means any person who does not have a fixed or regular residence and who may live on the street or outdoors, or in a homeless shelter or another temporary residence. “Homeless” shall also mean a person whose only residence is a residential hotel or who is residing anywhere without tenancy rights, and families with children staying in a residential hotel whether or not they have tenancy rights. 8. Has the right to equal treatment by all municipal agencies, without discrimination on the basis of housing status. 9. If the person is a child or youth, the right to enforcement of the educational protections under the federal McKinney-Vento Act (42 U.S.C. Sec. 11432),particularly with regard to Sections 11432(e)(3)(C)(ii)(I) and 11432(e)(3)(C)(ii)(II) of Title 42 of the United States Code, which provide that a school shall provide assistance to the parent or guardian of each homeless child or youth (or, in the case of an unaccompanied youth, the youth)to exercise the right to attend the parent’s or guardian’s (or youth’s) choice of school, and a school shall coordinate with the local educational agency with jurisdiction for the school selected by the parent or guardian (or youth), to provide transportation and other necessary services. (c) This section shall not be construed to eliminate any protection or right to representation available under any provision of law. 1. An employee shall not be retaliated against by his or her employer, for offering available public resources to a homeless person in order to protect that person from harm, including, but not limited to, offering or providing food, blankets, first-aid supplies, or water. 2. Any person or organization offering food or water in public spaces to any homeless person shall not be subject to criminal or civil sanctions, arrest, or harassment by law enforcement, public or private security personnel. 1. Obstructing a sidewalk, whether by a person or personal property. 6. Sleeping in a public place. 8. Bathing in public places. 9. Sharing or receiving food. 10. Inhabiting or sleeping in a vehicle. 11. Violating public park closure laws. 13. Any other law found to disproportionately affect homeless or low-income individuals and families. (e) Any person whose rights have been violated under this part may enforce those rights in a civil action. The court may award appropriate injunctive and declaratory relief, restitution for loss of property or personal effects and belongings, actual damages, compensatory damages, exemplary damages, statutory damages per violation, and reasonable attorneys’ fees and costs to a prevailing plaintiff. (f) The provisions of this act are severable. If any provision of this act or its application is held invalid, that invalidity shall not affect other provisions or applications that can be given effect without the invalid provision or application. Tagged 2013, Anatole France, Cleveland County, criminal, Federal Homeless Management Information Systems, Homeless Alliance, Homeless Person, HUD, language, NET, Norman City Counsel, OK, OKC, Oklahoma City, seen, United States Code, youth, Zakk Flash. Bookmark the permalink.